Learn how to Start your own blogging in 2019? Are you thinking to start a blog or website but confused about where to start from? It does not matter whether you want to create a blog to share your personal ideas or you want to promote your business. You will always need a specific guide to accomplish this task. Most of us think that we need technical skills to start a blog. It is not completely true. You just need to have some basic knowledge of computer and internet and your can easily start a blog by yourself. 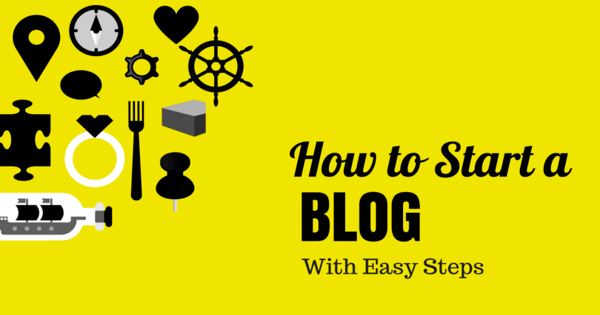 In this article, we will show you a step by step guide to start your blog own blog. You will also learn to generate basic income or regular income from your blog. The basic need of blogging is writing skills. If you love writing and want to share your ideas with the help of your words. You are made for blogging. You can make $1000 to $100000 from your blog. The only thing you need to follow is the basic strategies to grow your blog and audience. Your blog should be interesting to read. Always put yourself on the chair of reader and think, would you like this post. 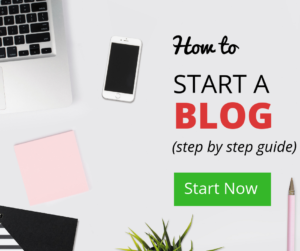 Now, without wasting anymore time let’s start this step by step process to starting a blog from scratch. When you are thinking to start your blog. Probably you should have some idea about it. To choose a perfect topic for your blog, you just need to think about what is your passion. People have blogs on the internet with different topics. It depends on you whether you want to blog about your personal life and experiences or you can also teach or provide information to the people on any particular topic. These are some most popular blog topics on the internet such as Fashion, Food, Technology, Travel, News and Sports. You should choose a topic in which you have deep knowledge. Try to write your blogs on a single topic. Most of the people confuse their blog with multiple topics covered. Ranking on Google will be also easy if you have a blog on a specific topic. You should start your blog on your particular interest. It is really helpful to write about your personal interest. If you won’t earn something for some months, it will create enthusiasm inside you. Sometimes it takes time to collect your regular audience and make money from them. There is multiple blogging platforms are available in the market. You need to choose which is best suitable for you. If you are a web developer or web designer, then you can choose according to your need. But if you are not a developer or don’t have a knowledge of coding, you should choose WordPress. 30% of all the websites on the internet are working with WordPress platform. WordPress is a very easy tool to design your website with simple plugins and themes. On WordPress, you can select a free or a premium blog plan. If you are starting your blog to just sharing your life experiences and want to make a personal diary blog, then you can choose a free blog setup of WordPress. But if you are passionate about blogging and want to make future in blogging, then you should choose a premium plan of WordPress. For that, you need to buy a domain name and a hosting provider. Domain names are subject to trademark issues. As you register your domain name, this name will be registered for you and no other person can create a blog with that same name. For example, Google.com has been created by Google creators so nobody else can buy ‘Google.com’ domain name. In addition, a hosting plan is necessary to host all the files of your website on a server. That means, you will have all the control on your files which is not possible with free blogging platforms. A web hosting provider is a company from which you have to buy the hosting plan. There are different plans according to your need. 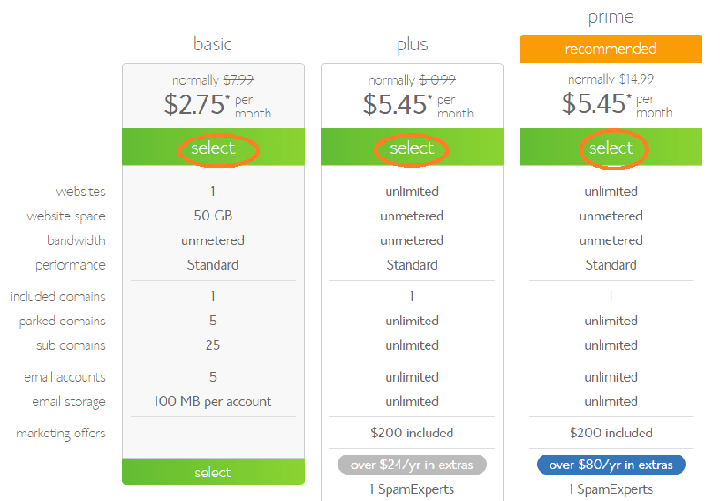 Every premium website needs a hosting plan and a domain name. Bluehost is the most recommended hosting provider in the market. It offers a free domain name with a hosting plan. Bluehost is the official partner of WordPress to provide fast and easy services. 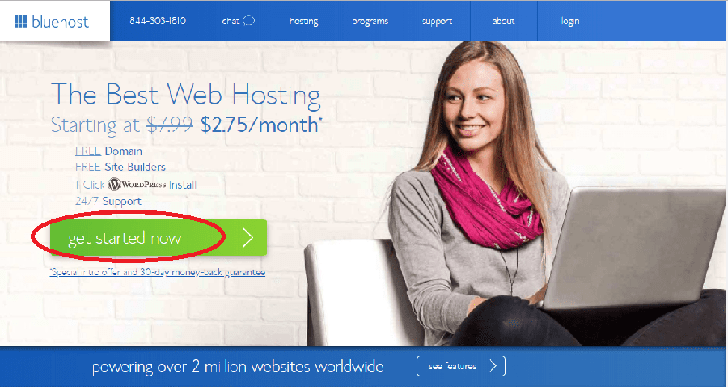 Now go the Bluehost website and purchase your domain and hosting plan. As you will visit the website, you will see a web page and a green button called “get started now”, click on this button and you will be redirected to a new page. Here you can choose a plan according to your need. For beginners, you should choose a basic plan. But if you can spend some extra bucks and want more features you should go for plus or premium plan. After choosing a plan, you will go to the next page. Here you can select your website name. You can select any name which is not already taken on the internet. At last, you just need to fill up your personal information on the next page. Select your payment option and package for years. 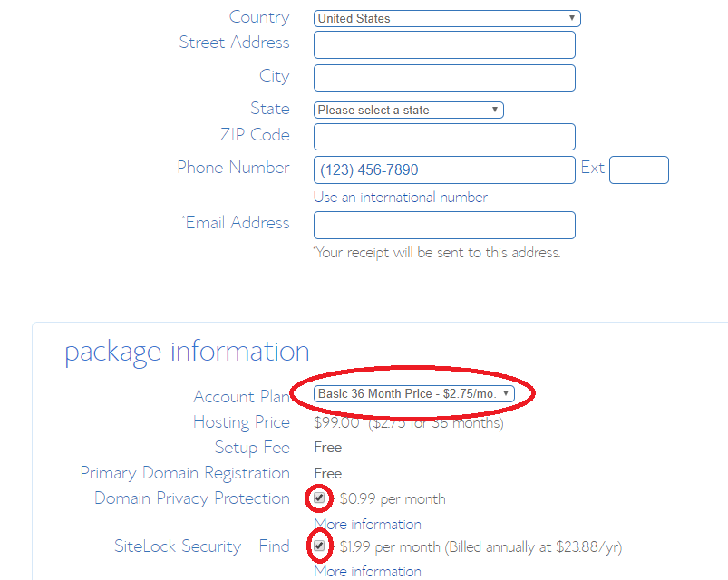 If you buy your package for a single year, it will be more costly compared to 3 years. We highly recommend purchasing the plan according to your need and budget. There will be already selected extra add-on services with your plan. You can deselect them. These extra services are not compulsory for a newbie. After you complete the payment process. 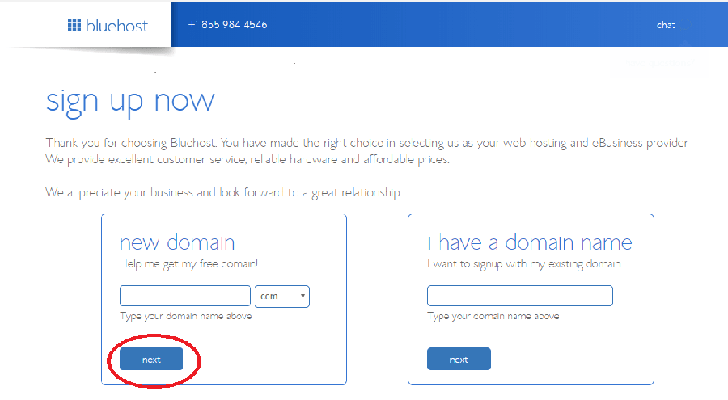 You will get an email with your login information into your Bluehost account. They will also provide you a customer care number for technical support which is available 24/7. After getting the login information in your mail. You can simply go to Bluehost and log in there. You will get a page where you can control all the activities of your website. Now inside your panel. There are different applications to start your website. You should select as it is the best and easy option. Find out the website section and select install WordPress. You will be sent to a new page where you can install WordPress on your site by clicking a single button called GET STARTED. On the next screen, you will be asked to choose your domain name for which you want to install WordPress. After that click Next. Now you will get a new page, here you have to create your site name, username, and password for your website. Remember that your username and password will be used to login to your website, again and again, so keep remember after making it. Now select all the checkboxes on the left-hand side and click install. After clicking the install button, just wait until the process is done. Don’t click on any button or anywhere else between the installation processes. As you see the WordPress installation is a complete message on top. The WordPress installation process is completed. You can close this window. Now type Yoursitename.com/wp-admin inside the URL box on your computer screen and click enter. Here you will get a login page, you have to enter the username and password here which you’ve just created in the recent steps. Now you will reach on your a page called Dashboard. It is the place from where you can manage all the activities on your blog. You can write a new post, manage comments, upload pictures and change your site design and layout. In the WordPress dashboard, you will see many options to customize your website. The first thing you need to do is selecting a good WordPress theme. In the Dashboard, you will see an option in left sidebar Appearance >> Themes. Click on it and you will visit a new page. On the top, you will see an Add New Button. Click on it and you will get to the page. There are lots of beautiful themes to make look better on your blog. You can select any theme which you like. After selecting your beautiful theme. You are ready to write your first blog post. In addition, these free themes provide a limited customization options. You will have a very few features to make changes in your site layout. Therefore, many premium theme companies provide fully customizable WordPress themes. After buying a premium theme, you can easily customize each and every part of your website. They also provide premium support to help you for designing your site. That’s why, I created a list of best premium WordPress themes for bloggers. You will be redirected to the editing area of your blog. You can enter the title of your first blog post and write the article. As you are probably installing the fresh version of WordPress now. You will see a new, amazing and more functional Gutenberg Editor. This is a more fancy editor with more functionalities and features. However, if you are not feeling this editor helpful in starting. You can install a plugin called Classic Editor to use old basic WordPress editor. Even I use that old editor and I am more comfortable with it. After successfully writing your blog. You will see a Publish button on the right-hand side. Click on it and make your first post live on your site. You can now go to your site and can see your post is live to the world. You can always come to this area and write a new blog post. Try to regularly write new posts to gain trusted readers for your blog. In the dashboard, you can easily see an option called Plugins. WordPress plugins are helpful tools to design your WordPress. There are thousands of plugins available in WordPress. There are different plugins to make different changes to your website. You can also read here a detailed guide on How to install WordPress Plugins. WordPress plugins are such applications to add more features on your site. After creating your blog successfully. You can start earning money by your blog. Yes, it’s true. You can also earn money by your blog. However, it’s not super easy to turn your blogging into a full time business. It takes time to gain trusted readers to earn money from them. If you are posting regularly, you will increase the number of readers day by day. There are different ways to make money online from your blog. First, you can sell different products on your website. Secondly, you can promote other’s products on your site and get a commission on it. You can read this guide to know different methods to make money online through your blog. There are three ways to publish advertisements on your blog. Affiliate marketing and Google Adsense are two primary methods. Google Adsense is the most popular advertisement platform in the world. Google AdSense is the easiest way to place ads on your site. You just need to register on Adsnese site and after your application approval. They will provide you a code. As you place the code in your site, your site will start showing ads on it. Google pays you for every click on their ads. There are different CPC (cost per click) for different ads. You have to complete google AdSense policies to apply for their monetization program. Affiliate marketing is another best way to generate a huge amount of money if your blog is getting good traffic. You can promote products of different companies who offer an affiliate program. You can show an ad on your site of the product. As someone of your reader will see that ad and buy that product. You will get some commission on a percentage basis. Moreover, you can also provide some space for direct advertising on your website. This method is more profitable than Google AdSense. However, you need to have enough traffic on your site to attract direct advertiser. Many bloggers sell direct advertisement on their blogs and earn passive income from them. There are thousands of resources on the internet to learn WordPress. You can also join WordPress forums and ask your doubts if you stuck somewhere with WordPress. You can also visit our WordPress tutorials to start learning WordPress. These tutorial post are most preferable for beginners. You can also find different WordPress tutorials on our site. Blogging is not as much difficult as many people think. There are hundreds of resources and people are ready to help you. I hope you can now easily create your own blog and start blogging. If you still have some doubts in your mind. You can easily write to us or leave comments below. If you liked this article, don’t forget to like and share this article. I often visit your website and have noticed that you post relevant queries for beginner. Thanks for sharing helpful content. Thanks for sharing this information. It is very useful to someone who would like to start blogging like myself.